V: Hey Scarlet. (pause as the person on other end talks) Yes. It has been a long time. (pause) No, sorry about that. I couldn't make it. Yep, back into the wrestling circuit. 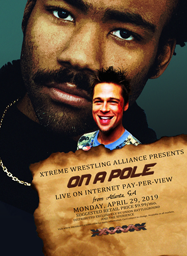 (pause) No, a new federation called Xtreme Wrestling Alliance. (pause) Hold on, I need to put you on a speaker phone. (pause. SHe laughs then pushes a button) Ok go on. Scarlet: Well the other day, he went out and just suddenly forgot what he was going for. V: Dude, girl, your dad is a kick. Love him. How's mom. V: Oh... sorry. How did it happen and when? Scarlet: Naw, don't be. Her cancer was in an advanced stage. She didn't want to keep living. So we disconnected her tube. About 6 months ago. I think you just called the week before. V: Oh... right. You can do that? Scarlet: Yeah, Korea is not like America. We get that option if we want it. We don't have a guilty conscious. We don't have protesters to go through. We don't need a lot of paperwork to get it done either. We just do. Usually the doctor's are ok with it. Scarlet: Not if you have to be the one pulling the plug on your own mother. But dad is in no condition to make that call. V: Yeah. That's true. But you have been gaining power since you took over the reigns from him. Is he happy with the job you have been doing? Scarlet: I think so. He doesn't tell me. But his men seem to like me so they follow. Which on that note, I'm assuming you need something otherwise this isn't just a social call. V: We've been friends for how long now? Why can't this be just a social call? Scarlet: I've known you how long now? You don't call me at this hour for a social call. You call me during these odd times when you really need something. Scarlet: Ok. How bad is it? What's she or he like? Do you need the Hand again? V: I was thinking more along the lines of the Five Fingers. I mean she is a Matriarch of her clan, she carries a katana blade to the ring and she has a Yakuza family backing her up. Scarlet: How Yakuza are we talking here? V: She has the whole dragon tattoo deal all up and down her back. Scarlet: Damn! Yes. They aren't currently on a mission. I was just about to assign them to take out an enemy of mine but yeah, sounds like you need them more. Scarlet: How long this time? V: I have no idea how long this feud will extend too. I can pay you if you need me too. Scarlet: For you Vesey, anything. But if it's longer than 6 months and the job is still going, well we'll talk about that when we get to it. V: You are the best my sweet. (pause, change of subject) Don't you miss America? San Francisco. Tenderloin District. Saturday Nights downtown. Scarlet: The only thing about America that I miss, is our trips to the Raves on Saturday nights that were down in Little Italy and the Castro. I miss you Vesey, I really do. But my family has need of me and dad's business can't manage without a head. I'm that head now. If you need me to come visit, I can but I can't stay long. Besides, you have Five Fingers coming and you haven't visited me yet. Not for a few years at least. V: Yeah, sorry about that, busy with Kenji and Geisha and wrestling and my band. Dad's opening a new restaurant out in Phoenix. Mom is heading a new project at Apple so can't go with dad. So dad needs me to come along and see all is ok with the opening. Scarlet: No worries. Just as long as I can be of help to an old friend (pause) Hey gotta go. Business line is lighting up. Say hello to the folks for me. V: Will do. See ya Scar. Love you much.